A light, intensively moisturizing emulsion with multi-level activity. It has a beneficial effect on the microbiome and its balance on the skin, it strengthens the epidermal barrier and stimulates cell renewal. It prevents the formation of wrinkles, evens skin tone, improves firmness and elasticity, regulates sebum secretion and reduces imperfections. Hypoallergenic, does not contain fragrances, dyes or potentially irritating raw materials. Dermatologically tested on sensitive skin. Hypersensitivity to any ingredient of the formula. The product is for external use only, avoid contact with eyes and mucous membranes. The first, unique, professional line of eco-ceuticals. An exceptional care that combines pro-ecological solutions that value nature, professional effectiveness and the safety of use with sensitive skin. All products are hypoallergenic, do not contain any fragrances or dyes. They are free from parabens and phthalates making them safe for pregnant women! They have not been tested on animals and do not contain any animal-derived ingredients! Individual eco-ceuticals contain between 97% and 99% of ingredients of natural origin*! Many of them are eco-certified. All products are biodegradable and packaging is easy to segregate. Eco-ceuticals take care of your skin on many levels! They protect and strengthen its microbiome, as well as actively moisturize, improve skin tone and show anti-aging activity. A pre and probiotic complex containing natural polysaccharides, juice from the root of yacón and lactic acid bacteria. It restores the balance of the skin’s microbiome (bacterial flora) and strengthens its biological protection. Obtained from edible seeds of the Indian Babchi plant. 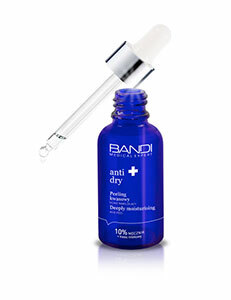 It is a herbal equivalent of retinol, shows its effectiveness but without leaving irritation. It gently exfoliates, improves elasticity and normalizes the activity of sebaceous glands improving the tone of the skin. It relieves existing irritation and accelerates the regeneration of the epidermis. Obtained as a result of fermentation of bamboo. It is a bioavailable source of silica, which improves cellular regeneration of the skin. They brighten dark circles under the eyes, stimulate collagen synthesis, have anti-oxidant properties, smooth the skin surface and reduce wrinkles. They are responsible for a relaxed look and a more youthful appearance. Apply every morning and evening to a cleansed face.